Hello! Thanks for visiting! It has been a while! 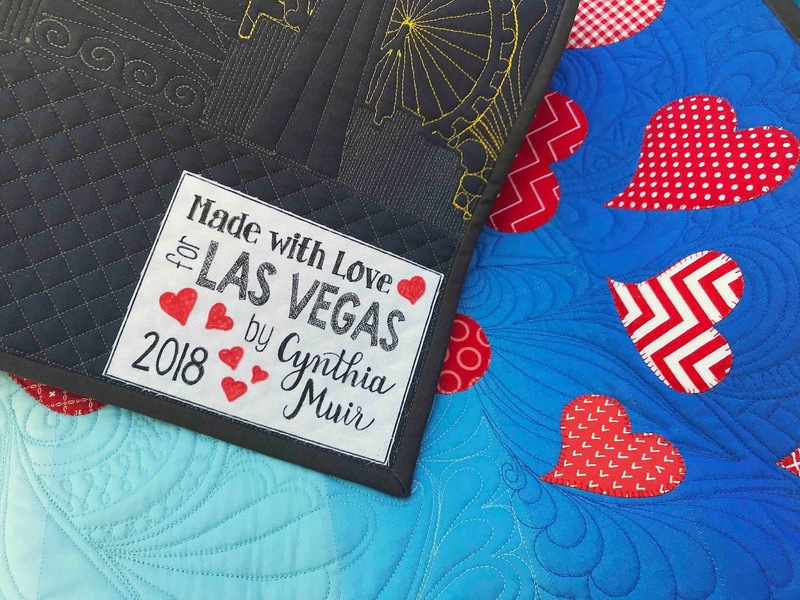 Blogger's quilt festival was the catalyst for starting my blog 8 years ago, so it seems only fitting that it would be the push I needed to get me to post another quilt after so long not blogging about my quilts. Say hello to my most recent quilt finish...The Vegas Sunrise Quilt. This little gem finishes at 40" x 47" and is a mixture of piecing and applique. After the design was OK'd I started collecting fabric. I planned on using solids for the background and found a few ombre fabrics that I thought would make the grading of the background easier. I also started collecting red tone on tone prints. I had decided to make all of the hearts- 58 of them- from different fabrics- to represent the individuality of each person who had died. My quilt guild was nice enough to donate some of the reds. Then, Christmas came, and we were building a house and moving and the quilt hit the back burner. Maren texted me a couple times to see how the quilt was going, and each time I assured her that I had not forgotten. Fast-forward to the middle of August. 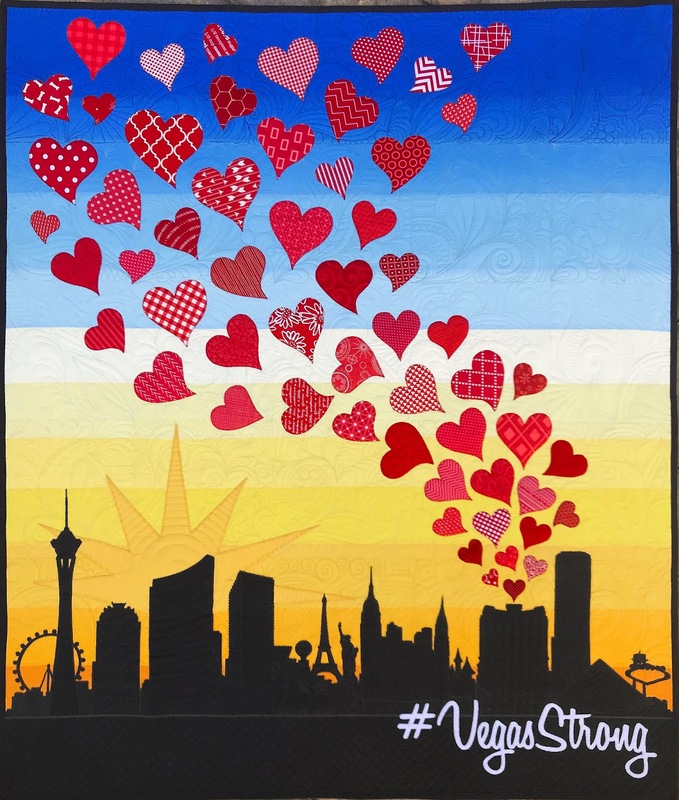 I realized that the anniversary of the shooting was approaching, and I hadn't even started constructing the quilt. Then we planned a trip to Las Vegas for the middle of September to visit my in-laws. I decided to make that trip my deadline for finishing the quilt and delivering it. Deadlines make the world go 'round...at least my world. So mid-August, I pulled out all the fabric i had collected, bought a few more fabrics and started working. I was not really planning on making the background striped. I had just made it that way in the mock-up to give the idea of grading that would make up the sunrise. In the end, I couldn't think of a way to construct the background that did not involve improv piecing (my nemesis) or take me forever, so I just went with the stripes. And I originally wanted to add some pinks and purples to the background, but couldn't figure out a way to do that and make it look good, so out they went. 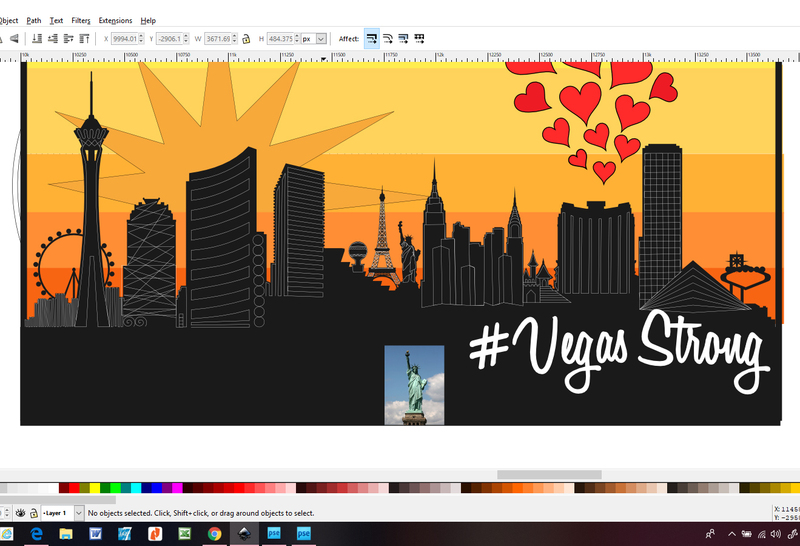 The sun shape, I took from the Sunrise Hospital logo and the Vegas skyline was an svg cutfile that I bought on Etsy for like 5 bucks! (Best 5 dollars I have ever spent!!) The beauty part about this is that I cut the most complicated part of the quilt out on my Silhouette Cameo in like 10 minutes. I had to do it in 3 parts because the whole thing was too big to fit the cutting mat, but it worked out well. 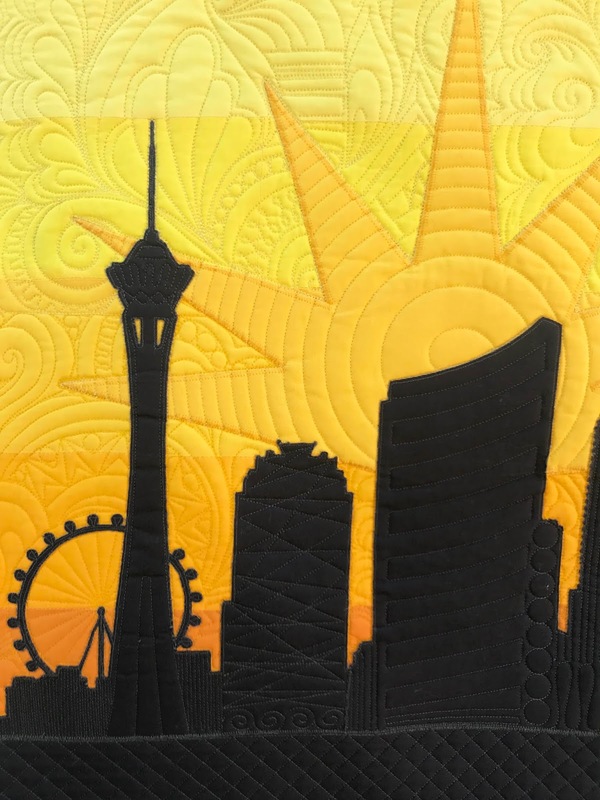 I appliqued the skyline to background and stitched it all down with a really short straight stitch. 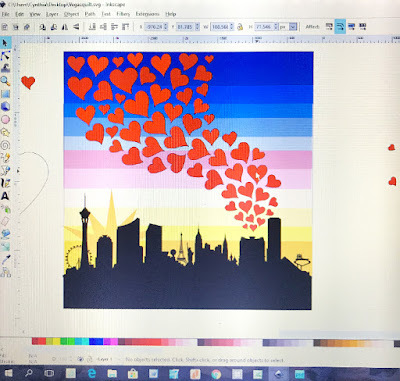 Then I printed out the hearts and traced them onto the background with a water-soluble marking pen. Then it was time to quilt the background. My cute quilting friend Pati came over and kept me company while I loaded the quilt and she helped me choose threads that matched for each section. At that point I was still trying to figure out how to quilt it (story of my life). I really wanted the quilting to be awesome, and at one point I remembered seeing Karlee Porter's graffiti quilting. I thought it would be perfect for the background, but I'm not a super enthusiastic (or talented) free-motion quilter. I thought about buying one of Karlee's big all-over graffiti motifs, but the one I really liked went from corner to corner down the quilt and I needed straight rows. I briefly entertained the idea of designing my own digital graffiti design (oh hahaha) but then found Karlee's Bliss blocks and decided they would be perfect! So I bought my 10 favorite blocks and started quilting! I absolutely LOVE this quilting!! It is so perfect for this quilt and it was really fun to watch each block stitch out! I did 5 blocks per row and moved them around and flipped some of them in the different rows so it looked more random. When I first started quilting this, I thought would just put the graffiti blocks through the whole thing and just change thread colors. 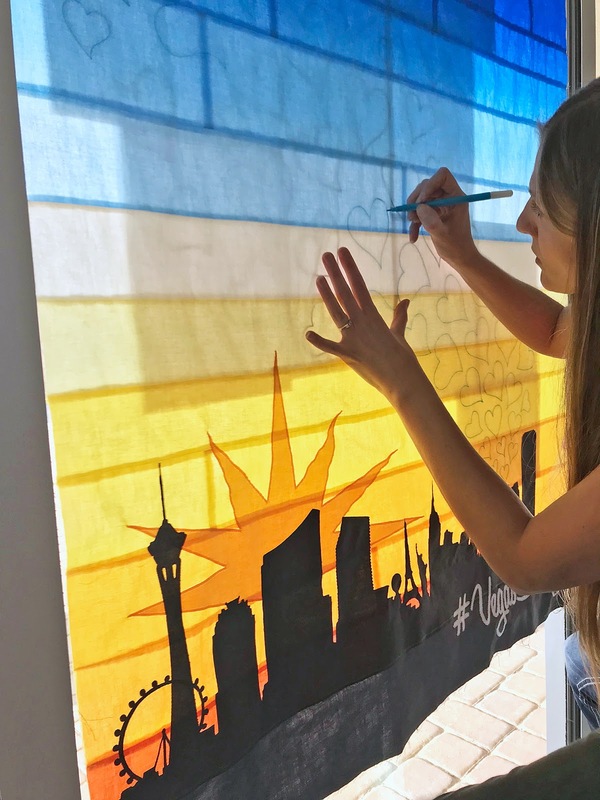 But by the time I got to the skyline, I had started imagining stitching detail into them that would make them look like buildings. Since my quilting machine is computerized, I can make pretty much any design and fit it in any space. 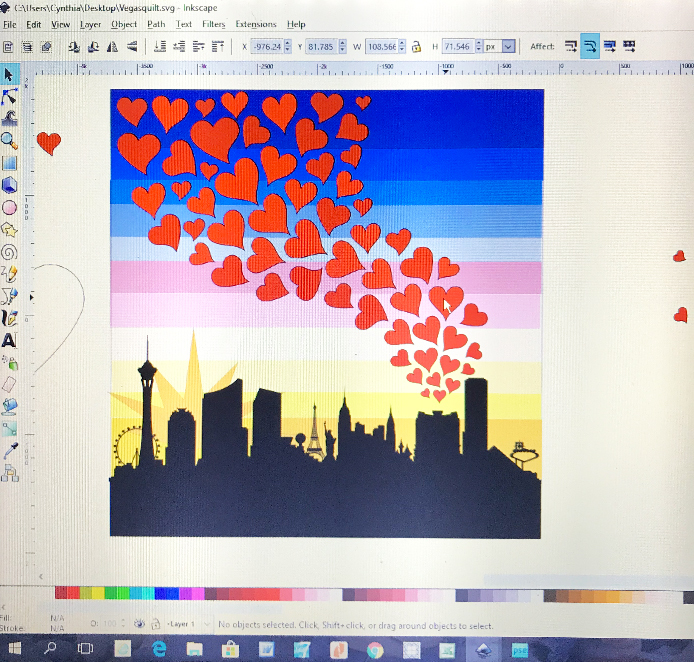 So I designed most of the quilting inside the buildings in Inkscape, right over the top of my quilt design and then digitized the designs and quilted them out (See white lines in photo above). 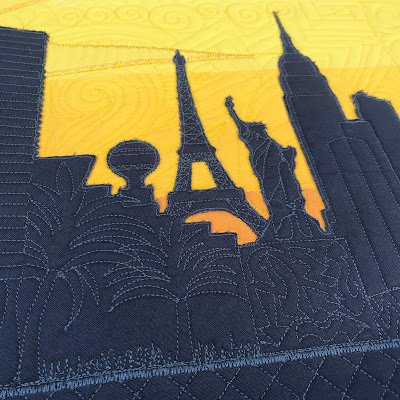 I looked at lots of pictures of the different hotels on the strip for inspiration and by the end I was quilting robes onto the Statue of Liberty! 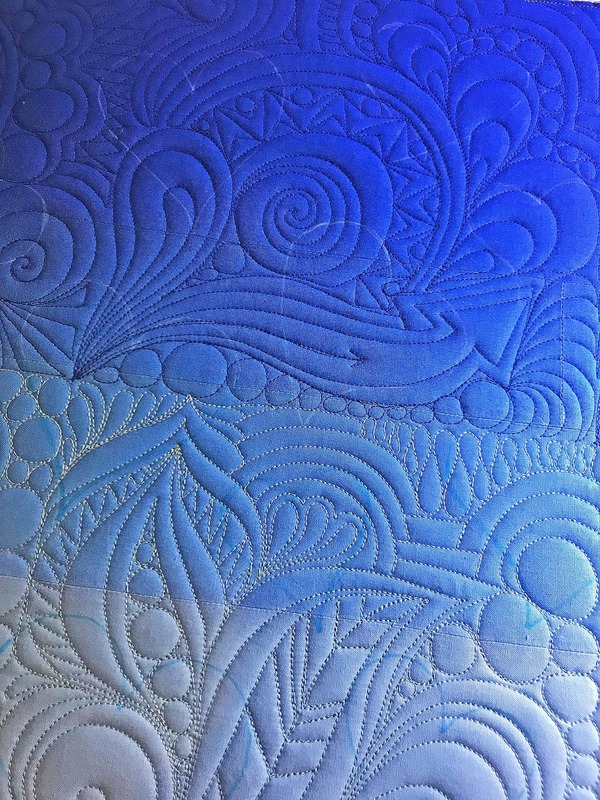 Below the buildings, I quilted different filler designs, like chevrons, swirls and ribbon candy. I had way too much fun with that section! For the very bottom of the quilt I went with a crosshatch design. I thought it made it look a little bit like a chain link fence when it was done. 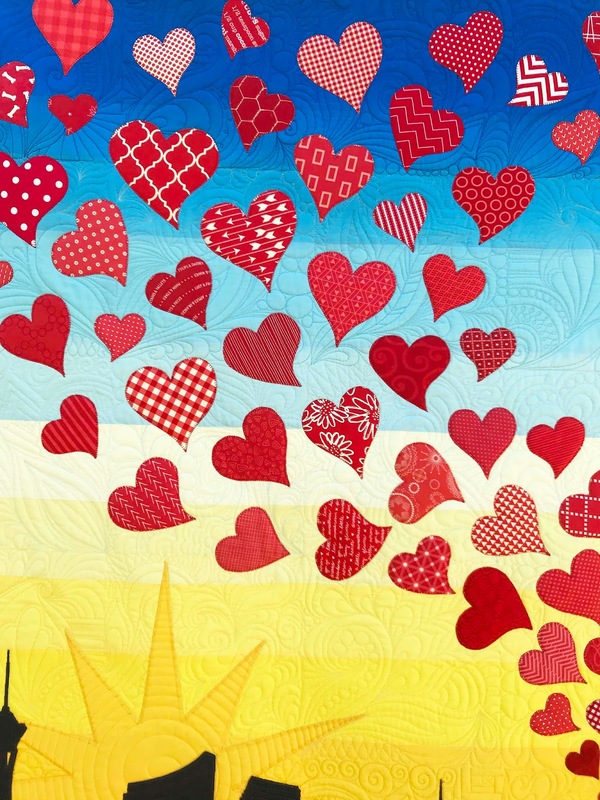 After the background was quilted, I added all the hearts. I put one layer of batting behind each so the quilting wouldn't show through and so they would puff out a bit. I used fusible web to stick them down and then stitched them down with a blanket stitch. Then I bound it and added a last minute label and headed to Las Vegas to deliver it. We found a spot to photograph the quilt on Freemont street (because we were over that way visiting the Neon Museum -which was very cool-lots of old Vegas neon signs) and then I got to see Maren again and give her the quilt. She told me that when the hospital volunteers saw it, they decided they needed to put it behind glass! I hope all who get to see it in person will enjoy it as much as I enjoyed making it, and remember all those affected by the tragedy. What a wonderful quilt Cynthia! It's message of love and support will live long while it hang prosudly in the Sunrise Hospital! Cynthia! What an honor has been bestowed upon you. 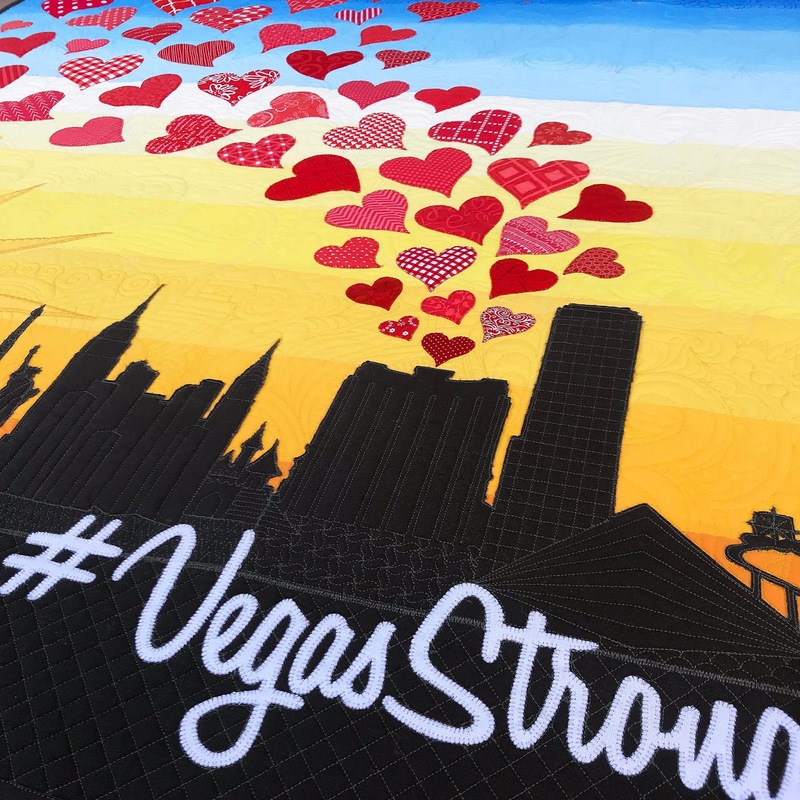 This quilt is an amazing tribute/memorial. Your heart was definitely in it. 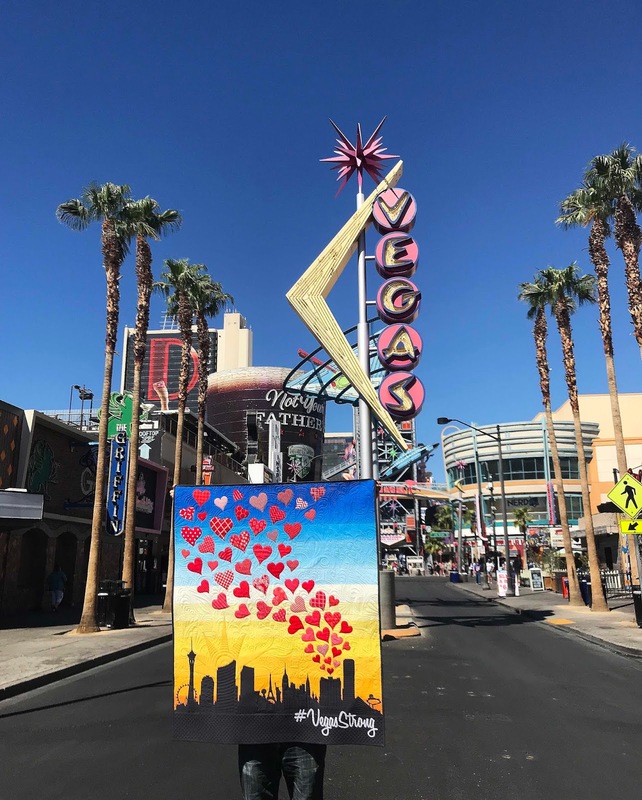 For all who were not there, or don’t even know about it, your story and quilt bring it all closer to home and delivers the power of love to all who bear the heartache and feel the loss. Your quilt hanging in the hospital will bring all who gaze upon it comfort and peace for whatever is painful or joyful in their life at that moment. It Is a memorial quilt and will be more than that to many, I am sure. Well done. Oh Annie!! Thank you! I have missed you! Hugs to you -hope all is well! What a wonderful job you did - it is an amazing quilt! Thank you for sharing your process - fascinating! Good job! This looks awesome. Also, please let me rewrite your name...my skills are much improved since that time. Thanks Juli! I think the name looks great! Beautifully designed quilt and very well thought out. Love the quilting too! This is a beautiful tribute. Good idea to put it behind glass. Your detail work is amazing. Impressive! Love how this looks. What a lovely quilt. 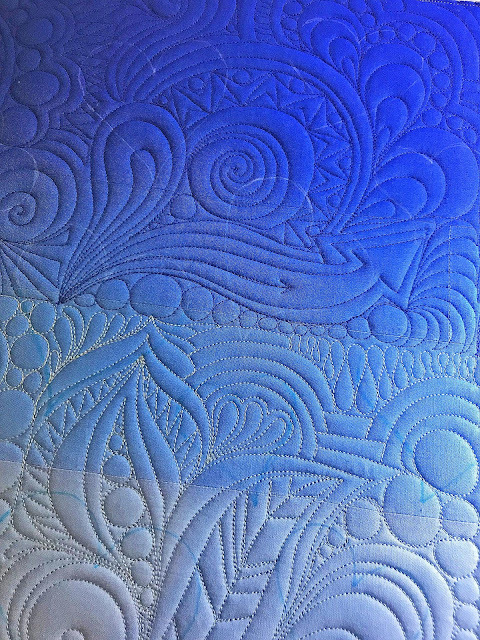 I really enjoyed reading your process about the computerized quilting. Yay!!! I'm so glad you posted this! It is AMAZING! This quilt is beautiful! It was definitely a labor of love as demonstrated by your thoughtful choices and attention to detail. This quilt is wonderful! from the construction, to the colours and the quilting. Sarah, beautiful quilt! I'm so sorry for the innocent souls that were lost in LV. I'm at a quilt retreat and one of our sewers quilted your Santa in the Trees quilt. OMG so cute! But I can't find it on your site. Do you still have the pattern to purchase? If so, where? Thank you.